Pope: Trump "is not Christian." Trump: Tell it to ISIS. Pope: Trump “Is Not Christian.” Trump: Tell It to ISIS. 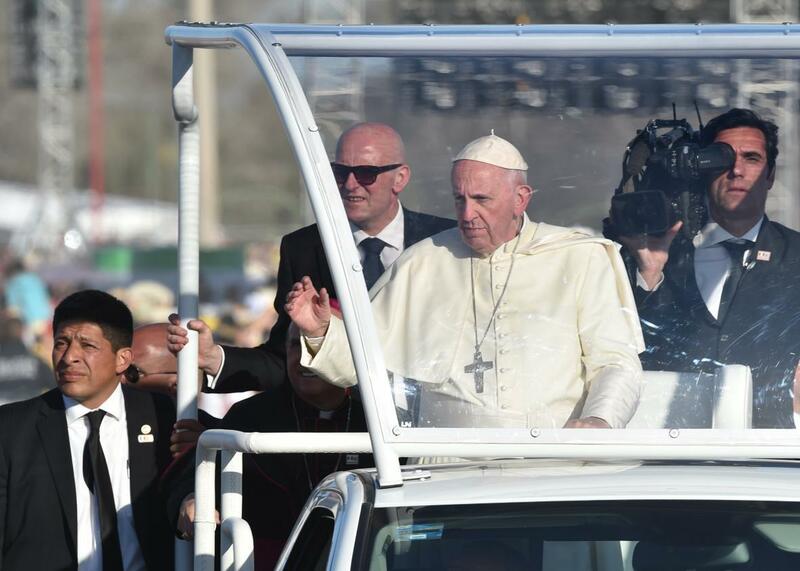 The popemobile rolls through Ciudad Juárez on Wednesday. Donald Trump is never one to shy away from a public spat. But Megyn Kelly’s got nothing on his latest sparring partner. The pope has been outspoken in his support for the rights of migrants and refugees and his trip to Mexico included a visit to the U.S.-Mexico border in Ciudad Juárez, where he gave mass for more than 200,000 people and laid flowers on a memorial for those who have died trying to cross the border. Trump’s rival Jeb Bush, a convert to Catholicism, was asked about the exchange and said that Trump’s Christianity is “between he and his creator.” But he also scoffed at Trump’s warnings about ISIS, saying, “The Swiss guard is probably taking pretty good care of the Pope.” Bush also said he supports building a wall “where it’s appropriate” to prevent illegal immigration but voiced his respect for the Pope. Thursday’s sniping follows several days of back-and-forth between Trump and the Vatican. The day before the pope arrived in Mexico, the candidate told Fox Business that the pontiff is a “very political person” who doesn’t understand “the danger of the open border that we have with Mexico.” He also suggested that the Mexican government had talked the pope into speaking out on immigration. A Vatican spokesman called these comments “very strange,” noting that Francis’ concern for migrants and refugees is global and that he has spoken about these issues in many countries, not just Mexico. This certainly isn’t the first time that the Catholic Church has inserted itself into a U.S. presidential race. In 2004, for instance, a prominent Vatican cardinal urged U.S. priests to deny communion to Catholic politicians, like then Democratic candidate John Kerry, who support abortion rights. But this is a very different Vatican and a very different U.S. election.